Spring is in full swing, and that means tons of engaging arts events in the Stevens Point area. Here are a few for you to check out. Don’t miss author, poet and filmmaker Sherman Alexie at UW-Stevens Point’s final Performing Arts Series event of the season on May 1. Alexie is the award-winning author of The Absolutely True Diary of a Part-Time Indian and the Lone Ranger and Tonto Fistfight in Heaven. 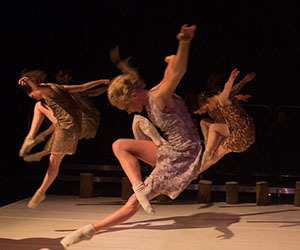 Danstage, the annual performance from UWSP Dance Department, is another enticing event in May. Don’t miss your opportunity to see faculty premiers and guest choreography. Performances are May 2-4 and May 7-9. Jazz fans should mark their calendars for May 9, when the Central Wisconsin Symphony Orchestra welcomes Randy Sabien & the Fiddlehead Band to Jazz Night 2014. Tickets are on sale now. The same weekend marks the return of the annual Portage County Cultural Festival. On May 10, spend the day learning about the Stevens Point area’s distinct cultures with ethnic food, arts and crafts, and live music and entertainment. The Arts Alliance of Portage County will hold its annual ArtsWalk, a celebration of local artists and performers, on May 16. Visitors will be able to browse and buy works form local artists, as well as enjoying live music, performances and children’s activities.